Practical, intelligent and efficient - for digital track and switch inspection MessReg CDM is the benchmark! The globally tried and proven measuring system provides automatic continuous data capture with impressive levels of precision: Pre-defined measuring points are automatically detected and stored, and any tolerance infringements are colour-highlighted while the measurement is in progress. This means it takes just a few minutes to fully check a switch or a section of rail. Comments can be entered at any time, including indications of the track's condition at specific positions. 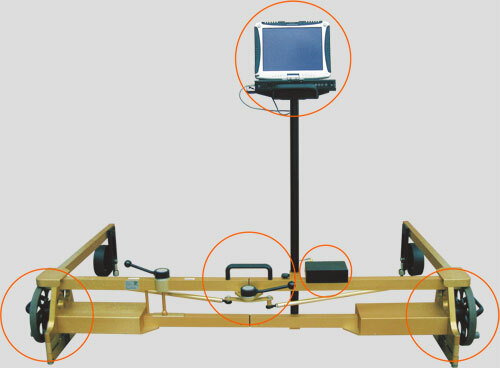 The measurement report is evaluated and outputted in digital form immediately after the measurement procedure. Continuous measurement with MessReg CDM also provides comprehensive track documentation. Alongside the pre-defined measuring points, the track gauge and cant values are recorded automatically at 5 mm intervals. The measuring system is rounded off by an all-weather computer notebook running a powerful software package. The software includes the actual data capture program, graphical data display and evaluation programs, and professional track and switch management functionality. Note: MessReg CDM is the first and to date only continuously measuring switch inspection system approved by Deutsche Bahn.